Brooke Branning is a singer, songwriter and entrepreneur living in Los Osos, California in San Luis Obispo County. She has a unique, sultry voice that is both vulnerable and powerful. Brooke has just released her first CD "It's Not Too Late" and is currently working on her second CD which will be released in 2010. Her style is all her own, meshing pop, rock, country and adult contemporary. A sultry mix of pop, rock and country thats fun and infectious. "It's Not Too Late" Reviewed by RadioIndy.com! "It's Not Too Late” by Brooke Branning is a powerful mix of Pop, Rock, and Country that has some real soul. Branning's strong, sensual voice is what gives this album its x-factor. The professional quality of the recordings let the songs show their true potential. The album shifts away from its Country base with tracks like "Love Is The Price" with a bouncy rhythm and melodic lyrics. One track that shines as a favorite is "Given Freely," a Country song with a sweet, catchy chorus accented by its angelic background vocals. If you’re a fan of Melissa Etheridge or Sheryl Crow then check out this gifted and talented artist and her latest CD, "It's Not Too Late" as it is soft Rock and Country at its best. 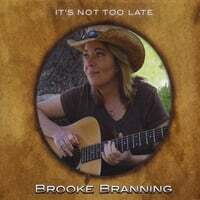 RadioIndy is pleased to announced that we have published our CD Review of Brooke Branning music to Facebook. RadioIndy created a CD Announcement Press Release for Brooke Branning on Digg.com! FANS: Increase the popularity of this DIGG press release by visiting our homepage at www.radioindy.com and looking for the "Press Release" section in the lower right. Here, you can find and "DIGG" this press release. RadioIndy is pleased to announced that we have published our CD Review of Brooke Branning music to CD Baby. FANS - Please checkout Brooke Branning online! CD Baby page and sample / purchase some great new music! RadioIndy is pleased to announced that we have published our CD Review on Amazon!. FANS - Please checkout Brooke Branning page and sample / purchase some great new music! RadioIndy is pleased to announced that we have published our CD music Review to iTunes.com. FANS - Please checkout Brooke Branning iTunes page play / purchase some great new music! Radioindy has published Brooke Branning CD Review to lala Music Online. FANS - Please checkout Brooke Branning la la and play / purchase some great new music!